Lehigh University sophomore Alexander Brown has been selected as the inaugural 2012 Clarkston Scholar. "We are looking forward to working with Alexander as he pursues higher education and a career in the Life Sciences industry." Lehigh University sophomore Alexander Brown has been selected as the inaugural 2012 Clarkston Scholar. Brown was awarded the $10,000 scholarship last night at the 2012 Pennsylvania Bio Annual Dinner and Awards Celebration. Brown is pursuing a degree in bioengineering with plans to continue his education at the graduate level. In addition to the monetary award, Brown will also receive exposure to the Life Sciences industry through mentoring from Clarkston Consulting experts as well as participation in Pennsylvania Bio events over the course of two years. Brown was selected among a pool of scholarship applicants with the assistance from an expert industry panel. 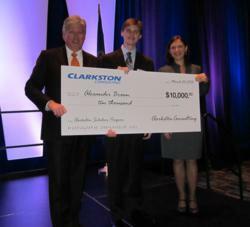 Clarkston Consulting established the annual Clarkston Scholars Program in 2011. A Clarkston Scholar is a highly-driven student who excels in the classroom, has a focused interest and passion for the Life Sciences industry, and intends to enter the Life Sciences industry upon graduation. For more information on the Clarkston Scholars Program, please visit http://www.clarkstonconsulting.com/our-story/culture/clarkston-scholars. Clarkston Consulting is a different kind of management and technology consulting firm. We deliver a unique experience for market leaders within the Consumer Products and Life Sciences industries. Considering professionalism, expertise, and value as prerequisites, we take service a step further through our unyielding commitment to the success of people as individuals, both our clients and our stewards. By combining integrity, adaptability, and a “whatever-it-takes” attitude, we have achieved an extremely high rate of referral and repeat business and a 10-year average client satisfaction rate of 97%. For more information, please visit http://www.clarkstonconsulting.com.